The Best Permanent Hair Straightening Hairdressers in Perth - No one does it better than us! 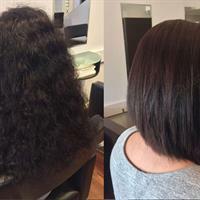 Permanent hair straightening takes a bit longer and is a lot more specialised, although is the ultimate in hair smoothness. Thermal rebonding is our most popular restructure service followed by Xtenso Moisture and Keratin (and yes a keratin that actually works). Hair will be left straight, permanently so you will have to wait for it to completely grow out if no longer required. On average most of our clients will have this service done about every ten to twelve months. 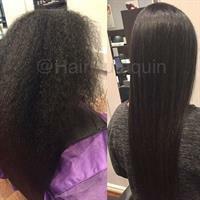 "Permanent hair straightening will damage my hair." Not so, but it will enhance any damage that has already been caused to your hair. Thermal rebonding will degrade the hair to an extent, but if the hair is in good condition to start with this would not be noticeable at all. At Hair Straightening Perth we use a sunflower ceramide based product free of ammonia and formaldehydes. "I will step out of the shower with shiny, pin straight hair without a single strand out of place." Some clients will but remember we just straighten the hair, not style it. Your hair will be straight but, depending on how sleek and polished of a look you want, you may still have to style it. Even people with naturally straight hair style their hair. The difference is dramatic, we have had clients that spend up to an hour styling their hair and now spend a few minutes (if that) to achieve the same look. We even had one client that no matter what could never wear her hair straight and now has no problem! "The salon down the road uses the same product as you and cheaper so for the same I’ll just go there." Not a problem, but please remember if the result is not the same once you have had the product processed on your hair you will have to wait until it has grown out before we can re do it for you. In Perth Makarizo is the most popular brand to use for thermal rebonding and we know that about 80% of salons that use it will not get a good a result as we do. How do we know? Because we have people call in every week asking us to look at their hair after they have had it done somewhere else (unsatisfactorily) and we give the same response. Come back in 6 months and we will test. The same product is NOT the same result. Our technicians are VERY experienced. Basically most products designed for this permanent hair straightening process work and work very well as long as the operator is adequately trained and follows the procedure "exactly". An example. For a salon to use this product they can just order it and start using it after watching a training DVD. Or they can go and do a one day workshop and then start using it. Or for optimum results you can take Hair Outaquin’s approach. Initially a qualified hairdresser will attend a one day workshop. After that workshop they will then need further training in our North Perth salon and we can quiet confidently state that our existing technicians are more experienced in Makarizo thermal rebonding than even local trainers. Further in salon training may take up to a year before the technician is allowed to take what we call a "real client" as until they have perfected application and technique they are not allowed to perform service on a full paying client. During this service you will be booked with one technician and not have multiple people working on your hair or be passed from one to the next. The application, tensions etc have to be consistent for the best results and this can only be done with one technician. Even saying all this after all that training they still will not be able to do what we call a re application (rebonding on an existing rebonding client) as technique different or afro hair. This requires even further training and usually occurs after about a year of doing standard rebondings first. 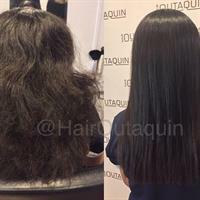 Hair Outaquin are unable take an appointment for any straightening services unless we have physically seen the hair prior. There is no obligation to proceed or cost involved for us to look at the hair. An appointment for us to look at the hair is not required just pop in during our opening hours. Please be aware that we will not entertain any service or consult if you bring young children with you it is too disruptive and during chemical straightening there are stages where you cannot move at all. On seeing the hair if we are happy to proceed and you are too a 50% deposit is payable to book an appointment for any relaxing, straightening or smoothing service. This will only be accepted in person the first time. No over phone payments accepted. Once you have become a straightening, smoothing or relaxing client we still take a 50% deposit for straightening service but can be done over the phone. 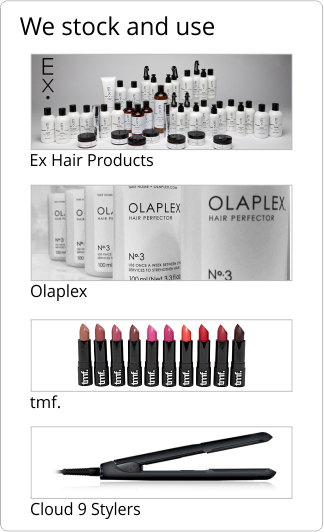 We have packages for permanent straightening offering pre Olaplex and all the take home care you need. Check out our service price page for details. The main request we receive is people wanting to check availability as they are only in town for a few days or they live far away and do not want to come in twice so they want to reserve a spot before coming in or want to know if when they come in if suitable can we do it straight away. The other is people not wanting to come in for us to see the hair unless they know they have an appointment booked on the day they want. 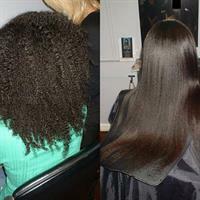 For more information about hair straightening including price information.